TThe tour starts with lunch in Arusha town at 1230hrs. 1400hrs, drive to Lake Manyara. Dinner and overnight at Kirurumu Tented Lodge. Breakfast at the lodge, followed by a morning game drive in Lake Manyara National Park whose inhabitants include hippos, monkeys, tree climbing lions, flamingos and other varieties of birdlife. Lunch at the lodge. 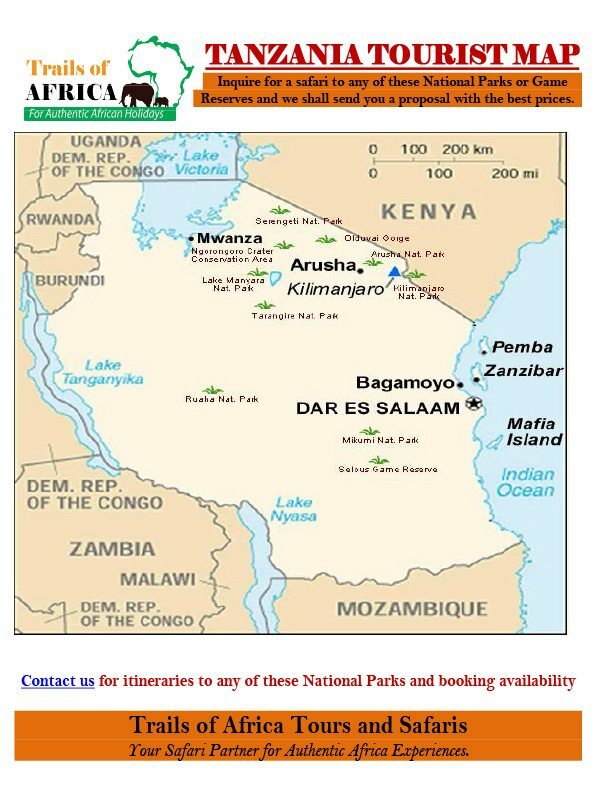 After lunch, drive back to Serengeti National Park, Dinner and overnight at the mobile camp. Lake Manyara National Park: Lake Manyara is a scenic gem, with a setting extolled by Ernest Hemingway as “the loveliest I had seen in Africa”.The Park is home to a myriad of bird life and the famous tree-climbing lions. The soda lake occupies 77% of the National Park total area of 330 sqm. Common animals include baboons, giraffe, impala, wildebeest, buffalo, zebra, elephant, hippos, with over 400 species of birds including water birds and the colourful migratory flamingoes. Spend two full days of game viewing in the Serengeti National Park: A World Heritage Site and Biosphere Reserve, Serengeti National Park is aptly referred to as “endless plains” by the Maasai. Serengeti provides sanctuary to the highest concentration of plains animals in the world. Within its area of 14,763 sq km are more than 4 million large mammals living in total wilderness freedom. About 35 species of plains animals can be observed including elephants, buffaloes, topi, wildebeest, gazelles, zebras, lions, leopards, cheetahs and over 400 species of birds. Drive to Ngorongoro Conservation Area via Olduvai Gorge, the site of Louis and Mary Leakey’s renowned archaeological discoveries. Their findings include some of the man’s earliest known ancestral remains. Proceed driving to Ngorongoro Conservation Area. Lunch at Ngorongoro Standard Camp, Afternoon at leisure.Dinner and overnight at Ngorongoro Standard Camp (Ngorongoro Sopa Lodge during April, May & June).